Most of us have heard of the ‘Fight or Flight’ response in stressful situations. This is the accepted view of the stress response – we react to stress by our bodies getting ready to fight or to flee. This reaction was intended for the sort of situations that our ancestors might have found themselves in – in real danger from, for instance, a wild animal. Some models describe ‘fight, flight or freeze’ because the fear effect often causes people to freeze. However new research has shown that the acute stress effect might be more complex and there are more responses involved and perhaps the order is a little different. These researchers have suggested a model which is ‘Freeze, Flight, Fight, Fright, Faint’. The ‘Freeze’ is a ‘stop, look and listen’ effect of fear. It is a hypervigilant response and by freezing, in the case of the sort of danger that this response was intended for, it may be more difficult to be seen by a predator as the visual cortex and the retina of mammals evolved to see movement above colours. There is also an increase in peripheral vision to see the lay of the land and, presumably, routes for escape. The next reaction is to Flee (so flight or fight would have been a more accurate description). This, as all self-respecting self-defence experts would tell you is the best response to being attacked – run! Unnecessary processes are curtailed – there’s no point in your digestive system continuing to digesting food if you are just about to become the meal and there is no reason for healing processes to continue if death is imminent. All the energy is diverted to processes that will help you flee – increasing heart rate and breathing to increase the flow of oxygen to the muscles and increased flow of fats and sugars to give them the energy they need. Fight is the next response. If you can’t get away then your body readies you to fight. You already have increased effectiveness of your muscles; hormones now increase your aggression and reduce pain. This is why we often don’t feel the pain of an injury until we have time to stop and notice. This is followed by ‘Fright’ – which is where the previous version would have put freeze and, to be fair, this does look like freezing. The freeze that comes with ‘fright’ is that immobility that comes with fear and the ‘playing dead’ that is often seen in the animal kingdom. Sometimes described as a vasovagal response, the Fainting, seen mostly amongst women and the pre-pubertal, may have been a response to save the lives of those who were not strong enough to fight. There may be a link here to the reaction that many women describe when they are really angry or frustrated about something – that they have to hold back tears. Could this also be an evolutionary response for those who were not physically strong enough to fight? Of course, most of the time when you experience the Stress Response there is no real danger to life so the body’s readiness to react is not used in the way it was intended. These physical reactions can harm the body if they can’t be adapted in some way to ameliorate their effects. Raised blood pressure and volume begins to put strain on the cardiovascular system and may accelerate atherosclerosis, high levels of cortisol may cause memory impairment, ongoing constriction of blood vessels may cause inflammation, tissue necrosis and renal failure, reduction of gastric activity may cause ulcers and other digestive issues, and reduced immunity leaves the body open to disease whilst changes in metabolic rate can cause weight loss or gain and has also been linked to increased abdominal fat which has been shown to increase susceptibility to diabetes mellitus. Raised levels of cortisol in the blood has also been linked to reduced bone density leading to Osteoporosis. The effects of chronic stress on the brain seem to centre on three main areas: the amygdala, hippocampus and prefrontal cortex. The amygdala, which has been implicated aversive learning, fear conditioning and anxiety, demonstrates an increase in volume and functional activity. This may lead to anxiety and hypervigilance in long-term stress. Conversely the hippocampus is shown to reduce in volume and functionality. As it is involved in memory, especially the emotional context, impairment can exacerbate stress as it can cause the inability to judge whether a situation is a threat or not further exacerbating the effects of stress and contributing to neuronal loss and brain ageing. The prefrontal cortex, sometimes described as the Executive function of the brain, which modulates both the amygdala and hippocampal activity, also shows reduction in volume with repeated stress; it is suggested that this may be in an adaptive mechanism reduce the risk of neurotoxicity but it is likely that this would affect decision-making processes. The good news is that Individual Perception has been shown to affect not only the amount of stress experienced but also its likely health effects. Research, which used data from an American 1998 national health survey and subsequent death records through to 2006 found that ‘perception that stress affects health a lot’, along with higher levels of stress is linked to a higher (43%) mortality rate than the same high levels of stress without the belief that it affects health. Possible explanations for this could be negative expectancies, resilience, locus of control in respect to health or the effects of increased levels of stress and its physical effects causing negative physiological and psychological responses. However it may be because of the difference in the body’s reaction when people experience challenge rather than threat. When a stressor is seen as a challenge there is an increased cardiac efficiency and dilation of the blood vessels, increasing peripheral blood flow. This has been described as an approach orientation whereas a threat is associated with reduced cardiac efficiency and vasoconstriction, signalling an avoidance orientation. What we can learn from this is that reappraising the stress response as functional and adaptive rather than anomalous provides both physiological and cognitive benefits. There is also benefit to be had by taking the Stress Response to its intended conclusion. 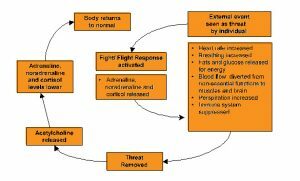 Physical activity like running or aerobics will use the physical effects of the Flight phase and allow the body to come back to balance more quickly. The Fight phase can be ameliorated by using a punchbag or doing martial arts. The Freeze stage can be useful in figuring out your options in a situation and the Fright and Faint stages are times when you are best advised to rest and recuperate.